Boys say their instructors show them how to decapitate blond, blue-eyed dolls with kitchen knives. This summer, in his hometown of Raqqa, 13-year-old Mohammad was forced to attend a children’s training camp established by the Islamic State of Iraq and Syria (ISIS). When his father opposed his son’s conscription, ISIS fighters threatened to kill him. Mohammad left for camp, which his father describes as a form of “brainwashing the children.” After his return, his mother says she was surprised to find in his bag a blond, blue-eyed doll – along with a large knife given to her son by his ISIS supervisors. When she confronted Mohammad, he told her that the camp manager had distributed the dolls and asked that the children decapitate them using the knife, and that they were asked to cover the dolls’ faces when they performed the decapitation. It was his homework: practice beheading a toy likeness of a blond, white Westerner. Mohammad’s father says the other camp parents corroborated his son’s story – their children had all been given dolls and knives, too. In Raqqa, ISIS’s Syrian stronghold, residents say children are slowly being forced into lives under the Sunni militant group’s notoriously brutal interpretation of Sharia law. Those living in the eastern city say ISIS has instituted rules banning traditional children’s games and forcibly conscripting children to ISIS. They say ISIS is recruiting children under 15 to special ISIS camps established to introduce minors to the foundations of their brand of Islam. Some of the male children are then transferred to an adult military camp, where they are trained to use arms and fight. Sources familiar with activity inside the camp say in order to teach the children how to use knives, ISIS has distributed dolls with blond hair and blue eyes, like many Europeans and Americans, dressed in orange prison uniforms like those worn by prisoners in Guantanamo. The children are given large knives and told to decapitate the dolls. 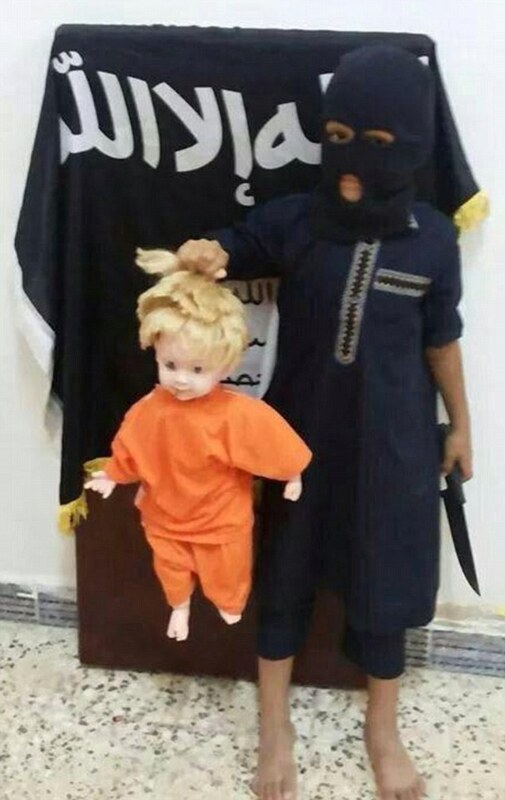 Mohammed said that older kids were asked to show the rest of the group how to decapitate dolls. Anyone who failed to perform the task was punished. Soon after Mohammad’s return from ISIS camp, his father, spurred by the fear of seeing his son become an ISIS fighter, decided that the family must flee Raqqa. Gathering what they could, they left for the Turkish city of Urfa. Mohammad’s mother says many other families also fled Raqqa due to forced child conscriptions. “Nowadays, it’s the children in Raqqa who come out to see the executions and crucifixions carried out by ISIS,” the father says.